Offered as a basic doorphone solution for addressing basic entry and exit applications, and as an advanced supervisory solution utilizing RFID technology to provide access control and personnel location.  ESI Presence Management from Action CTI is a hardware and software solution incorporating an innovative combination of RF scanning technology and ESI’s business communications systems. ESI Presence Management from Action CTI is offered as a basic doorphone solution for addressing basic entry and exit applications, and as an advanced supervisory solution utilizing RFID technology to provide access control and personnel location. Optional third-party PC software for time and attendance management further enhances what this amazing product. And, to maximize its value to you, you can team ESI Presence Management with ESI Media Management on an IP Server 900 or properly equipped ESI Communications Server. Door phone operation — ESI Presence Management supports basic two-way door phone operation. The integrated doorphone operation includes strike-plate-type lock control, two-way audio connection, CALL key, and large backlit two-line display. 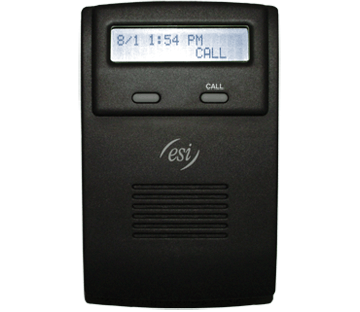 ESI Presence Management RFID Reader doorphones may be mounted inside or, with the addition of an optional weather-resistant acrylic enclosure, on the exterior of a building. Remote entry control — Where an ESI Presence Management RFID Reader is installed, a call can be made to a station, department, or Esi-Link location by pressing the CALL key. If a user answers that call, the user can then use the remote door unlock feature key to unlock the associated door. The CALL key destination can be different for day and night modes. Access control — Issued building keys can be easily replaced with ESI Presence Management RFID Readers by distributing assigned electronic keys to all authorized employees. These devices can be of the “scan card” type or a key ring fob. Scanning of the electronic key activates the strike lock of the door, giving access to authorized personnel. Use of ESI Presence Management RFID Readers will reduce incidents of weather-related corrosion of key contacts and security breaches caused by employees’ codes inadvertently becoming known to non-authorized persons. Access scheduling — Access is controlled by the recognition of programmed RFID electronic key devices. Each electronic key is programmed to be recognized by one or more ESI Presence Management RFID Readers, in any combination. Additionally, individual tag devices may be programmed to allow access only on specific days or between specified times. Up to seven schedules are maintained for each tag device. Presence indication — ESI Presence Management hardware and ESI system software combine to create a powerful tracking personnel solution. The integration between the ESI system and ESI Presence Management allows station status to be modified by simply entering or leaving the building. This feature provides a powerful advantage to both managers and co-workers who must be aware of employees’ presence. Users with a DSS appearance of an extension on their station can track that person’s status at a glance. Distinctive lamp indications for In- or Out-of-Building are all triggered by scanning into or out of ESI Presence Management. Historical records of employees’ presence in the building and hours worked may be added optionally. Personal Call Routing — Unique to ESI, this operation performs immediate and automatic control of station functions for the scanning user. Programming of the station associated with the scanned electronic key reflects the user’s call-handling choices, based on presence in or absence from the building. Choice of Intelligent Call Forwarding™ destinations, off-premises “reach-me,” call routing methods, mailbox greetings, message notification options, and quiet time programming can all be automatically altered when leaving the building. Call forwarding destination selection can be controlled simply by scanning out when exiting the building. Calls can be immediately routed to voice mail instead of ringing the station several times, saving callers’ time and eliminating unnecessary office noise. Alternately, an external number, such as a cell phone number, may be defined as the “absence destination” so that calls follow the station user wherever he goes. Mailbox greeting selection enables users to define different outgoing messages on their mailbox for when they are in or out of the office. This allows callers to have a better understanding of the availability of their party, encouraging messages to be left instead of blind hang-ups. It saves the mailbox user the time and aggravation of switching between outgoing greetings. Message notification options include dialing a pager, calling an external number or another station number, or taking no action at all. Additional parameters include the amount of time the ESI system will delay before making the notification, the number of attempts made to notify, and the amount of time between attempts. When a user scans out, his choice of all parameters can be modified to accommodate his absence. When he scans in again, his normal selections are reinstated. This automatic modification to message notification ensures that important messages won’t go unattended for hours or overnight. This increases all mailbox users’ productivity. Quiet time is the period during which a mailbox user wishes to suspend message notification and the off-premises “reach-me” callout feature. Perhaps this time period begins at the close of the business day, but is enabled 10:00 AM to 3:00 PM on weekends. The mailbox user may function in a tech support capacity so, when leaving the building, he must continue to be notified of calls and messages until 11:00 nightly. The time limits established for enabling and disabling quiet time are automatically controlled by scanning into or out of the building. This eliminates the need for a user to access his mailbox to switch on or off notification prior to leaving for the night. Remote-site support — The ESI Presence Management RFID Reader’s IP version can operate over a wide-area network (WAN) for remote-site applications. Users can monitor, control, and provide scheduled access at remote sites in addition to their own building. The IP version also can be utilized on a local area network (LAN) where preexisting Ethernet® cabling is in place or where pulling telephone cabling is impractical. Time and attendance management — With the addition of an optional third-party software package, ESI Presence Management can document employees’ time records based on scanning into and out of the building. Integration among the ESI system, ESI Presence Management, and the third-party software simplifies timesheet preparation and payroll functions. An Ethernet® connection is provided to the customer’s LAN via the ESI system’s NSP (Network Services Processor), which passes RFID scanning activity to the customer’s workstation PC running the time and attendance software application. The host PC is not required to be a dedicated unit, nor does it need to be a server. The third-party software formats the attendance history of each scanned employee in a way that is easily imported into many payroll software packages, such as ADP® and QuickBooks®. Many companies that initially believe such an automated payroll application is out of their reach financially or too sophisticated for their company find that, in fact, this option saves countless hours in payroll preparation, error correction, and employee negotiation over time worked and absences. Video monitoring support — When paired with ESI Presence Management on an IP Server 900 or a properly equipped ESI Communications Server, ESI Video Viewer software2 can provide live video monitoring of an organization’s facility. Simply add an ESI Video Adapter or a compatible camera and download the Basic version of ESI Video Viewer to enhance remote entry control. The optional Advanced version of ESI Video Viewer adds a number of other capabilities, including customizable multi-camera viewing and color-coded motion detection indications, that greatly enhance the user’s video monitoring experience. This product’s control of door locks requires use of electric door strikes, which ESI recommends be installed by a professional locksmith. Product specifications and features subject to change without notice. For more information, contact Action CTI. 1. The IP version of the RFID Reader requires an IP Server 900 or an ESI Communications Server running appropriate system software. 2. See the ESI Media Management section for more details concerning this product, including system and computer requirements.